Someone sure screwed up. Really screwed up. have enough width to allow turns onto, and from Main Street. A couple of weeks ago, during all the hullabaloo about bricks, stonewalls, concrete someone made a comment about the intersection of Haynes Street, and Main Street being too narrow to allow a large truck, or a tractor trailer unit turn onto Haynes Street from Main Street. The reverse is true as well. A large vehicle, or trailer coming out of Haynes Street does not have the space to make a turn onto Main Street in either direction. The radius needed to turn is just not there. How can this be? There is no restriction as to what vehicles can use Haynes Street so it must be designed to accommodate all vehicles. Haynes Street was built wider, with a wider shoulder years ago when it was no longer Route 15, and I-84 was built. It had become a "feeder road" for I-84 for car, and large truck traffic. As a feeder road the design for its intersection would be different. A rest area was built for cars and trucks that houses Sbarro's and Roy Rodgers, and years later a much larger truck stop was built on the road, Sturbridge Isle, now Pilot. It is natural to assume that large vehicle and local truck traffic would use this intersection since they use the road constantly. The re-construction of the Center School at the this time that Route 131 was also being rebuilt would have been an excellent time to redesign, and build a wider intersection at Haynes and Main Street. Well, unless we address the mistake immediately we will be living with it forever. They will place will place a large yellow sign on Haynes Street warning truck drivers not to drive any further toward the center of town, and advising them to turn around or get off onto I-84. There will be trucks that drive to the end of the road, and attempt to make a turn. There will be knocked over signs, traffic light posts, and flipped over granite curbing, and that is only the minor things that will happen. What you can guarantee will happen is a tractor trailer will attempt to make the radius going into, or coming out of Haynes Street, and not be able to pull it off. It will be stuck. there have been problems with the turn already. 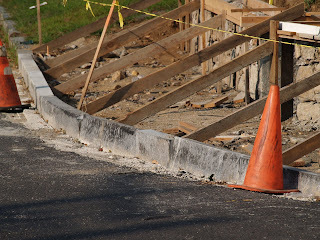 The curbing has already been damaged by the tires of heavy trucks and has been knocked out of place. I think we need to solve this brick/concrete sidewalk issue ASAP so that we can put our energy towards this intersection dilemma even faster. It would also be interesting to hear from local government, and Mass DOT regarding this intersection right about now. I think some explanation is forthcoming. Who knows, there may be an excellent explanation. Maybe, but I don't think so. I think they are flummoxed by this as we are, and will have to think hard, and run fast in order to fix it. I'll be waiting to see what comes next. Click on photographs for enlarged view. MassDot Project Development & Design Guide Chapter 6 Intersection Design. Download print version for review, the web version does not work as well. What?? You mean trucks will have to be turned around before they get to see the beautiful brick sidewalk at the common???? What a shame! Yes, there have been problems with the turn already. We have seen curbing knocked out of place quite recently.I wonder if school buses and motor homes can easily make the turn? RV's and Motorhomes won't be able to make the turn, either. Thanks, I hadn't thought of the vehicles that actually bring the money to town. School buses are out of luck, too. This reminds me of the cemetery gate on Main St. in Southbridge, just a little before the rotary. The story goes something like this: Mr. Wells was a quiet man, but one thing really bugged him - funeral traffic close to his home. Mr. Wells was also a rich man, so he donated money for a new cemetery gate, built to his specifications. The gate was built, and the opening was too small for vehicles to pass through. Now, generations later, the gate still stands and cemetery traffic has to use another entrance. 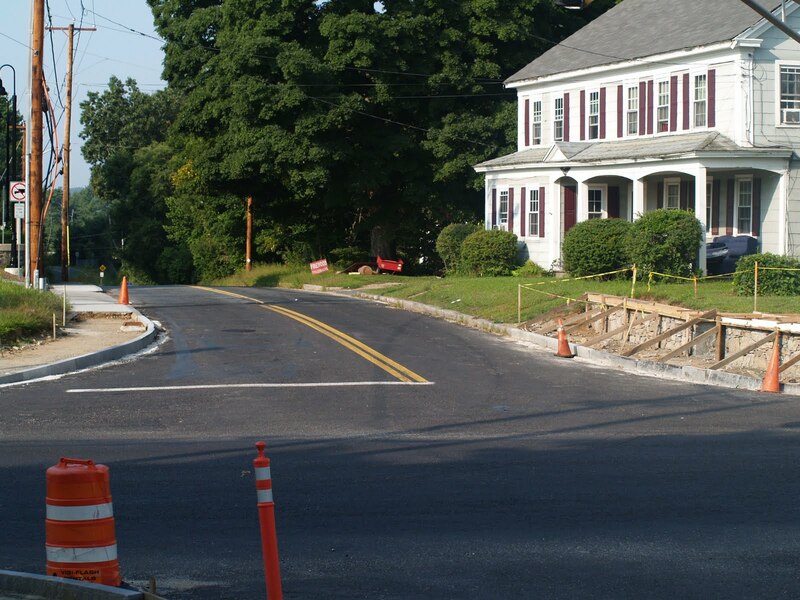 Haynes Street in Sturbridge is now narrower than ever. Trying to keep certain traffic away from the desired picture perfect scene? Limos won't be able to make the turn either. We've been thiMking again! Sure "Anonymous," you can say that trucks won't "get to see the beautiful brick sidewalk." Don't forget that without trucks, nothing that anyone buys gets anywhere. Heaven forbid we allow anyone who isn't of some certain class to see our impractical brick sidewalk that costs everyone in town money. I hope that our town government is looking into this, and can't imagine why this project has been blindly continuing along when a big problem at the intersection has been there for all to see right along as they've narrowed the entrance/exit at Haynes Street. Did no one notice when the curb stone was actually knocked over and later put back into place by someone (I wonder who)? What was a bad intersection is now horrendous. How can the people who are involved in running this town be so unaware of what is really important? Or, if they WERE aware, why wasn't the project stopped? I almost expect someone to place a tub of flowers with a "Mission Accomplished" sign at the end of Haynes Street any day now. I would suggest that big rigs, motor homes, garbage trucks, school buses, fire trucks, fuel trucks, and snow plows, etc. be sent up there tomorrow for trial runs. And we had better re-check our town finances, just in case we are responsible for a big re-do. Are we planning to put in a brick sidewalk in front of the old Center School? I wonder how the sidewalk will hold up with heavy vehicles running over it everyday? I wonder what difficulties will be endured in bringing building materials to future projects on Route 15. Will anything of any size have to use I84 in all comings and goings? Who gets to make that decision? This is not new and it has been talked about in the past about having tractor trailer tucks use an 84 exit to 131 or 20. Haynes street is too small for tractor trailers. What about long cars, ambulances, firetrucks, RV's......?